After bringing the Fun to well over 10,000 amazing clients, our very own New Year Kick Off event share the very special celebration of our own 15th Birthday! With our journey getting better and better every year and definitely no end in sight, it's great to have a sit back and have a reminisce on how far Sunshine and your Fun Experts® have come. Gather round Sunshiners and let your Fun Expert® Will share with you the backstory on our journey (Spoiler Warning). Sunshine Events was born 2003 in the spare bedroom of Sunny and James Sandwell, our very own Directors of Fun! What began as a couple devoted to bringing happiness and fun during their weekends, has since grown to a multi-award winning and largest event equipment hire company in the UK. Starting as a two-man operation, Sunshine Events has since grown into an 80+ team made up of a specialist group of people we've come to know and love as The Fun Experts®. The very ethos that built Sunshine Events is reflected in each and every one of our Fun Experts®. Whether it be their Expertise, Creativity or Reliability, our Fun Experts® always go that extra mile to ensure unforgettable memories are made on a daily basis for every client! So how do you entertain a Fun Expert? Little did our Fun Experts® know, but we had a trick up our sleeve (and that's not including the Magician). As soon as they walk in our Experts were greeted by our Magic Selfie Mirror Where they were welcome to strike a glamorous (or not so glamorous pose) to capture a memory of the night. Next up, they could throw some Kobe style shots on our latest Basket Ball hoop throw. If they considered themselves a Michael Jordan pro, they could do a two-player Vs mode against the clock! Of course, we couldn't forget our revamped retro favourite...PONG! Many matches (drinks rounds) were decided using this amazing game! What started off best of 3 games would quickly grow to best of 10 between some Experts. Finally, if the Fun Experts® were looking for something with a little more sophistication and finesse, we brought along our Casino tables which came accompanied with experienced croupiers. Despite betting with our very own funny money, I still went bust after 3.47 minutes (the less said about that the better). After an amazing meal, it was time to roll out the awards and recognise the hard work that goes into our events, from that initial phone call all the way to the final door is closed on our van. Ranging from Fun Expert of the year all the way to Newcomer of the Year. 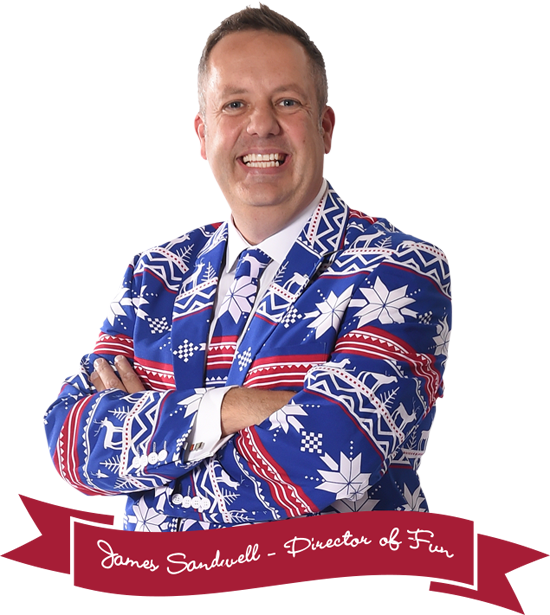 "The Fun Experts® are the most important asset here at Sunshine Events, and it is they who make Sunshine the brand we know and love" Director of Fun Sunny Sandwell. Eventually, after a short pit stop to the bar, the Sunshine team were introduced to a great game only conceived recently, but with a Fun Expert twist. The world was introduced to 'The Giant Sock Game' and we couldn't be more thankful to the crazy minds of Camille and Ryan! Finally, from here at Sunshine HQ, this 15-year journey has seen Sunshine Events grow from strength to strength, building upon our ever-expanding knowledge and most importantly FUN! But these 15 years are only the beginning for Sunshine Events, we have so many more exciting things coming that we can't wait to share with you. You Ask, We Answer: How safe are your inflatables?